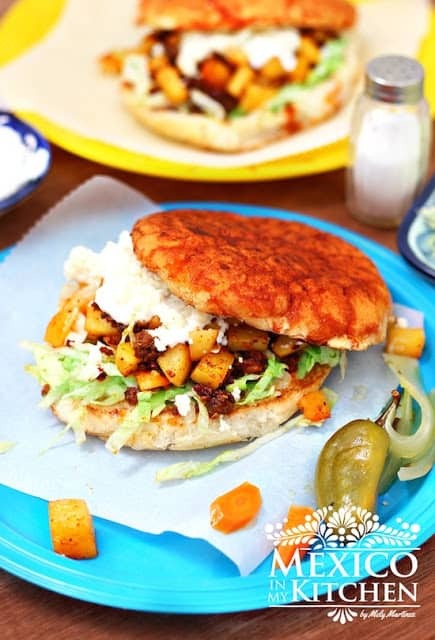 In Mexico City, a “Pambazo” is a sandwich made of a particular type of bread stuffed with potatoes and chorizo and then drenched in a guajillo sauce, served with lettuce, cheese, and cream. There are other sandwiches with the same name in other parts of the country, like in the State of Veracruz, where the sandwich is filled with refried beans, ham, and even chorizo and pickled chipotle peppers. This particular bread, also called Pambazo Mexicano, is very similar to a Kaiser roll but dusted with flour and without the seeds. Some of the research I did found that the name comes from colonial times, when the bread could be said to delineate the social classes. Since bread made with white, refined flour was mostly consumed by the higher classes (like viceroys, bishops, etc. ), the commoners ate bread made out of brown flour. This cheap bread was thus very popular, and was called “pan bajo”, or “lower bread”. In the meantime, cook the chorizo in a skillet over medium-high heat. It will be ready in about 8 minutes. Place guajillo peppers, 1 cup of soaking water, garlic clove, oregano, and peppercorns into a blender. Process until you have a smooth sauce. Strain and place in a bowl. To assemble the Pambazo, place some chorizo and potatoes on each toasted roll, then top with the shredded lettuce, cream, and cheese. Serve with a hot salsa or pickled jalapeños. Enjoy! This particular bread, also called Pambazo Mexicano, is very similar to a Kaiser roll but dusted with flour and without the seeds. In Mexico City, a Pambazo is a sandwich made of a particular type of bread stuffed with potatoes and chorizo and then drenched in a guajillo sauce. Place the diced potatoes in a saucepan with hot water and cook over medium-high heat. It will take about 10-12 minutes for the potatoes to be cooked. If you don’t find the teleras, you can easily use Kaiser rolls or another roll with a slightly hard crust that won’t crumble. The reason I didn’t call for actual pambazos for the bread in the ingredients is that I know they can seldom be found outside of Mexico. You will need a strainer and a pastry brush for this recipe. Receta en Español Pambazo de chorizo y papa. I’m not familiar with guajillo peppers. Is there a substitution? I live in the Willamette Valley part of Oregon and the town of Woodburn, fortunately, has some great panaderias, little restaurants, and small shops. I need to get over there to find a tortilla press, so I’ll look for these peppers while I’m there. ¡Muchas gracias, Mely! Try looking for them in your local Latin store, I had seen them even at Walmart. An also online. You can use california or new Mexico Chile pods I personally like those better they’re not as sweet.